We are thinking about purchasing the Vegas 25.3 and was curious about leveling the unit. Is it difficult and what type of leveling blocks do you recommend? Would an aftermarket automatic leveling system be a good investment? For our 24.1 I use the Lynx Levelers. For most campgrounds I've only ever had to use 1 or 2. The most out of level spot we park is our driveway--takes 15 of them to level it. I wouldn't consider an automatic leveling system a good $ investment ... but sure would be nice to have! I've considered them but we often camp in locations where landing pads would be necessary so auto-levelers wouldn't save us much time. The stacking leveler blocks are pretty easy and I recommend 3 sets if you camp in primitive locations otherwise 2 sets will usually facilitate getting you level. I put level gauges in the cab and after a few setups I can now estimate how many blocks it will take to achieve level right from the drivers seat. Usually we get acceptably level on the first shot. We were out in ours 4 1/2 months last year, mostly in national, regional and state parks with no hard pads and I don't think we actually got out our Lynx levelers more than half a dozen times. If you are careful which site you pick and how you place your RV, we have found that most times we don't really need to level. And it adds 10-15 minutes to setup, which means a 10-15 minute delay to our first glass of wine. The wine is usually more important. I have the HWH Kick-Down Levelers. I also carry the plastic Stacker leveling pads because many campsites don't want the levelers digging into their asphalt. I have also used them under the levelers when I have been in a National Forest campsite on sand. I think they are an effective tool when I park. There is already too much to do when I setup camp without constantly jumping in and out to check for level. If I had a class B or C where ingress and egress was via the driver door, it would be different. 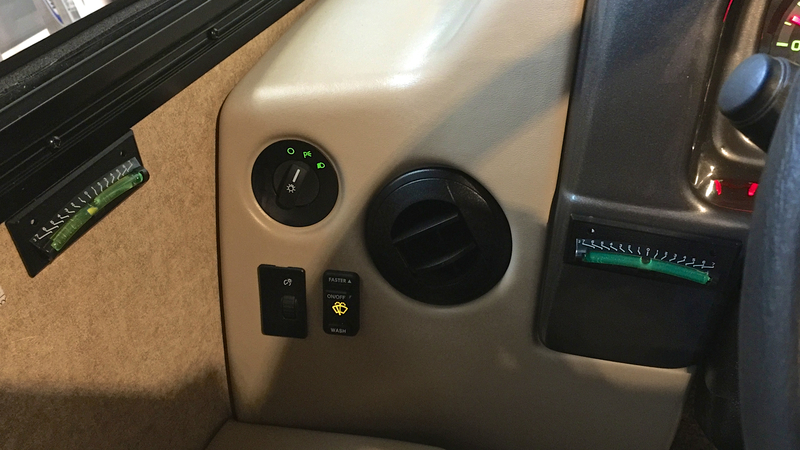 Where would you place the level gauges in ur RV? Just purchased it and have not used a second full tank of gas yet so don't know MPG yet. All new models are on the E450 chassis and have the new 6 speed transmission per D Koffman regional Thor Rep for Vegas/Axis. I'm happy! About leveling - we only stayed in it two nights and two parks and didn't need to level it. I have blocks and plan to use them if needed. Level HWH may be on the list but they are $5k installed and we are waiting to see if we need them. 1) Pocket doors rattling and won't lock closed. Dealer's service department adjusted holes for pin. Driver's side door should shut and lock flush with wall and now does. Passenger side there are wiring harnesses behind it so the best you do is flush with wardrope which is out farther than kitchen side wall. No rattles now. 2) Entrance Door detent fell off. Reinstalled with loctite. After one overnight stay and 350 miles return trip home no problems. Wife loves it and she is now driving it to releave me. This is new as she would never drive the 38 ft DP. I drove it in desert cross winds and its not bad. I was pulling a Wrangler. Love the power! 1- bathroom heater vent - location near door pointing under door and the room gets cold with door shut. 2 - When bedroom slide is closed for traveling the HVAC control is behind the slide wall and you have to access it by opening the slide window. Really stupid location. 3- and of course the wiring harnesses behind the passenger side pocket door. Make sure the doors latch and don't rattle. 4 - the front window shade is a pain to operate but I manage. C - Add elbow to sewer connector - access is a pain. (Thor did change it to swivel but not good enough) - may go with macerator not sure yet. D - Add front steering stabilizer (purchased Safe-T-Plus waitning for it to arrive). E - replace the two accordian shades with day/night ones. Other windows have black out shades - why not all windows?? we also have half dozen loose ones which I got for the DP we use to have for it's jacks. Since the unit is level now - mount them to show level - and you will be able to get back to that setting later. I first leveled the RV using the refrigerator as my reference. Lucky it was installed square with the rest of the coach because all counters and floors were also level. Then I put one level on the flat open part of the dash panel and one just under the window. These have marks so you can see pretty precisely the level state. If you have an iPhone you can download a free level app from the App Store. It works well. I have automatic levelers and the phone app is spot on. Could you steer me toward a resource for the neat little level you have placed under the window on the driver's side? Thanks! [QUOTE=TyCreek;26118]I first leveled the RV using the refrigerator as my reference. Lucky it was installed square with the rest of the coach because all counters and floors were also level. Then I put one level on the flat open part of the dash panel and one just under the window. I had put a set of those on our 5th wheel. Dang...I have an Android phone! !